Super Savonia V12 is created for huge sauna rooms. It is recommended for commercial facilities like leisure and fitness centres that are used very often. It has 12 heating elements and a stone capacity of up to 100 kg. All metal parts of the heater are stainless steel. It is provided with adjustable legs that stand on the floor and it is operated with a separate control panel. 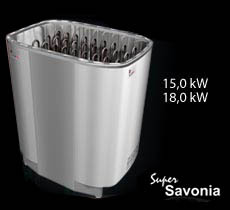 Super Savonia V12 is available in 18,0 kW and 24,0 kW.